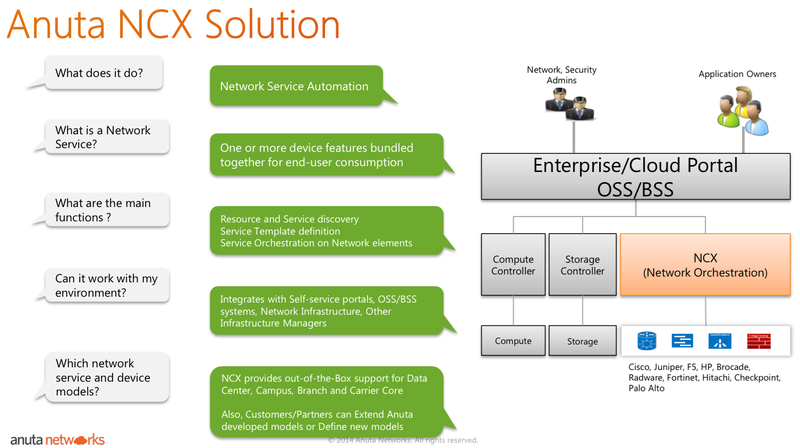 Anuta Networks’ NCX platform is for multi-vendor orchestration at scale. NCX fits in the SDN space, allowing operators to create service catalogs that can be deployed across a wide variety of gear from various networking vendors, including Cisco, Juniper, Brocade, and Ericsson. I co-hosted a webinar with a live demo of an earlier version of their product here. 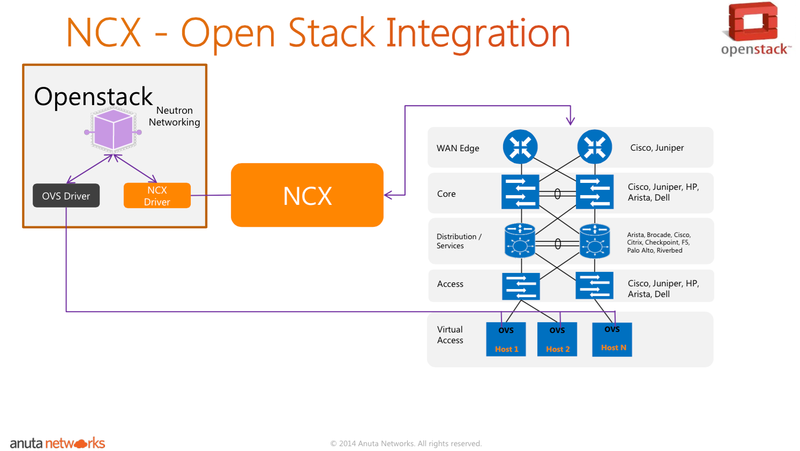 Anuta Networks, the leading provider of network services orchestration solutions, today announced an updated release of NCX 4.0 with significant enhancements in support for OpenStack, NFV and YANG modeling. OpenStack support. The Anuta ML2 plugin will translate Neutron calls into NCX calls. In other words, OpenStack users can provision the network using Neutron like they always have, but allow Anuta to be the translator to whatever underlying Anuta-managed network lies below. That’s a powerful capability for OpenStack users, considering that the list of network gear Anuta supports continues to grow. NFV support. NFV is network functions virtualization. At its simplest, NFV includes virtual network appliances such as the Brocade Vyatta Router, Cisco CSR1000V, and the other kit I write about here. Anuta support for a growing list of virtualized network functions (VNF) shows you where the market is heading. YANG modeling support. The big note here for me is that Anuta is following a standard modeling language now. If you aren’t aware,YANG modeling is a standard way of abstractly describing network devices. YANG is also a hot topic in the IETF, a topic we recently covered (at least tangentially) on Packet Pushers here. My brief take? Standards are good. Let’s do things the same when that makes sense. Also worth mentioning is that NCX is in the “lifecycle management” business, where a virtual machine is instantiated, licensed, torn down, and tracked automatically. Lifecycle management is a big deal for shops that spin up and spin down virtual machines with frequency. The other company that leaps to my mind in the lifecycle management space is Embrane, although Embrane seems to be somewhat Cisco-centric.